African-American voters in North Carolina were “targeted with almost surgical precision” by the North Carolina legislature, according to a three-judge panel for the Fourth Circuit Court of Appeals. Judge Diana Gribbon Motz wrote the opinion dismantling, point by point, all the provisions rushed through the Legislature in the days immediately following the landmark voting rights decision in Shelby County v. Holder on June 25, 2013. 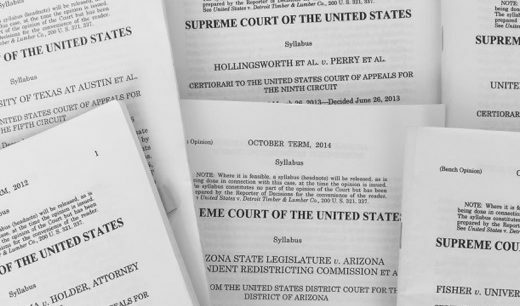 In the Shelby decision, the Supreme Court released states that, after passage of the 1965 Voting Rights Act, were required to clear all changes to voting policies and practices with either a federal court or the Department of Justice. Former slave states, where Jim Crow laws abound that disenfranchised minority voters for decades, were released from the pre-clearance requirement and allowed to make whatever changes they wanted to voting policies. States like North Carolina and Texas moved immediately – within days – to initiate laws increasing restrictions on voter access. In North Carolina, one day after the Shelby decision, the State Legislature designed and accelerated passage of an “omnibus” bill with five provisions restricting voting access. These provisions, aimed at curbing voter fraud, disproportionately affected African-American voter turnout in myriad ways. · Provision one required voters show a DMV-issued ID in order to vote. The bill excluded non-government issued identification and no longer allowed voters to use recently expired IDs. According to Judge Motz, African-Americans disproportionately lack DMV-issued identification. · Provision two eliminated early voting days from 17 to 10 when 60% of blacks voted early compared to 44-49% of whites. Among the 17 was one of two Sundays which historically are “Souls to the polls” days when African-American churches provide transportation to polling places. · Provision three eliminated same-day voter registration, an effort that disproportionately affected blacks who are more likely to move and need to re-register and vote on the same day. · Provision four eliminated out-of-precinct voting which affected black voters who tend to lack access to the kind of voter education programs that inform them about their correct polling places. Because of the increased rates of mobility, African-Americans are more likely to go to the wrong polling place. Legislation like this in North Carolina is exactly what Shelby opponents were afraid of: Fast-tracked restrictions and laws framed in seemingly race-neutral ways that don’t appear on paper to have the intent to disenfranchise but have the effect of doing exactly that. Despite appearances, NAACP v. McCrory articulated a clear message to other states that discrimination “need not be the sole or even primary motive for the legislation, just that it was a motivating factor.” Restricting access to a group of people, particularly racial groups, dilutes voter efficacy. This hampers their ability to elect members of a specific party and results in racially polarized voting. As African-Americans have consistently voted Democratic, the Court found these restrictions imposed by the North Carolina state legislature in 2013 – a time when Republicans had the majority in the House, Senate, and the Governor’s mansion – intentionally discriminatory to black voters and likely to have an adverse effect on Democratic candidates. The facts Judge Motz methodically presented revealed concerted efforts to subdue the effects of rising black voter turnout, efforts that reflect insidious machinations by Republicans to dilute an influential bloc of voters in as fast a way as possible. Take for instance black voter registration in North Carolina prior to the 2013 bill, which grew to 51.1% between 2000 and 2012. African-American turnout also grew from 41.9% in 2000, to 71.5% in 2008, and 68.5% in 2012. “Not coincidentally, during this period North Carolina emerged as a swing state in the national elections,” according to the decision. Vote dilution mitigates the power that comes with racially polarized voting. Since African-American voters in North Carolina overwhelmingly vote Democratic, [85% of African-Americans voted for Kerry in 2004, 95% for Obama in 2008; 27% of whites voted for Kerry, 35% for Obama] any restrictions would protect the very architects who designed the law in 2013. Fast is an understatement. Take for instance the glaring disparity in the way the first draft of the bill – which in its 16 pages included only one minor voter identification provision – was handled compared to the second draft, a 57-page “omnibus” mother of a bill that included five voter restrictive provisions. The first draft, released in April of 2013, received six weeks of hearings and debate, and the backing of opposing party members. It sat unchanged until June 26, 2013, one day after the Shelby decision was announced by the Supreme Court. That day the Legislature put the same bill on steroids, editing the one provision and adding four more. The second draft offered no public debate or action for a month, was released on the down low for which no minutes of meetings about the bill exist, and moved through the General Assembly in a record three days. “This hurried pace, of course, strongly suggests an attempt to avoid in-depth scrutiny,” wrote Judge Motz. Particularly damning was the fact that the legislature requested data that broke down DMV-issued identification ownership, absentee voting, early voting, same-day registration, and provisional voting by race during the drafting of the bill. Analysis of this data would’ve (or should’ve) revealed to lawmakers that African-American voters are disproportionately impacted in each category. With this revelation, any argument by the State that there was no intent to discriminate against black voters and no knowledge that the restrictions would have such adverse impacts is stunningly impossible. You’re a state with a proven record of voter fraud that wants to quash this. Fine. But if their intent was honestly to curb voter fraud these restrictions look more like the State brought a machine gun to a knife fight. The three judge panel reversed the decision of the lower court and would’ve likely recommend the case be remanded back to the state and lower court for revision or reconsideration. Not this time. Writing that a remand “would accomplish little,” they, in essence repealed the law and gave no second chances. While the Judges could’ve sanctioned the State by putting them back under a Section 5 pre-clearance requirement, they stopped short of going that far. The next steps for North Carolina are to either request an en banc hearing in which all the judges at the 4th Circuit would rehear the case, or they could appeal to the Supreme Court. It’s likely that even if they got four Justices to grant a hearing of the case they would end up with a 4-4 decision, which would leave this decision in place.